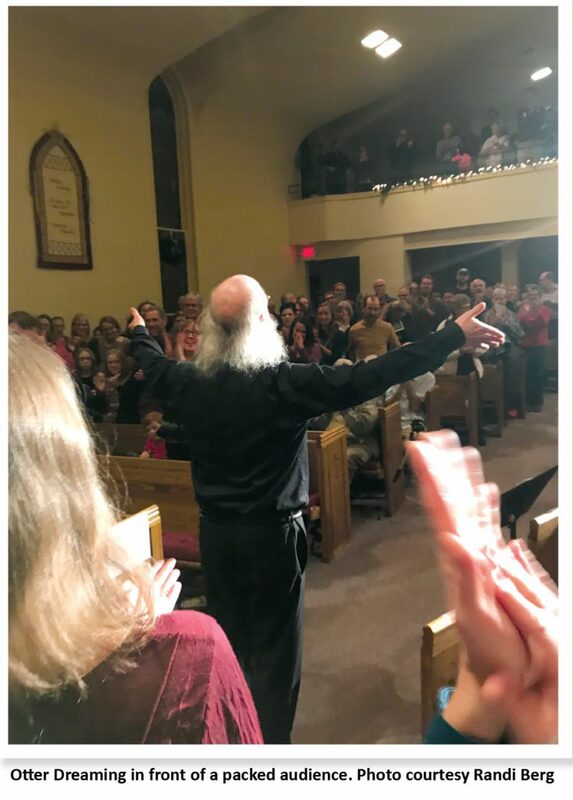 Decorah’s winter solstice concert, Burning Bright, celebrates 20 years of bringing light in the darkness and giving back to the community. Choir member Kristine Jepsen chats with founding members and directors as they reflect on years past and prepare for this season’s performance. “Oooh, that one’s my favorite,” fellow alto Emily Neal whispers as we open our binders to “The Parting Glass,” a traditional Scottish tune about toasting one’s friends. We’re sitting in choir rehearsal for Burning Bright, an annual winter concert that brings together singers and instrumentalists in the Decorah area. Kathy Reed, who co-directs Burning Bright with Otter Dreaming, settles at the keyboard, ready to prompt us, as late-afternoon sun slants in through First United Methodist’s stained-glass windows. We’ve sung this rollicking, bittersweet song before, and that’s all the more reason we want to get it right. 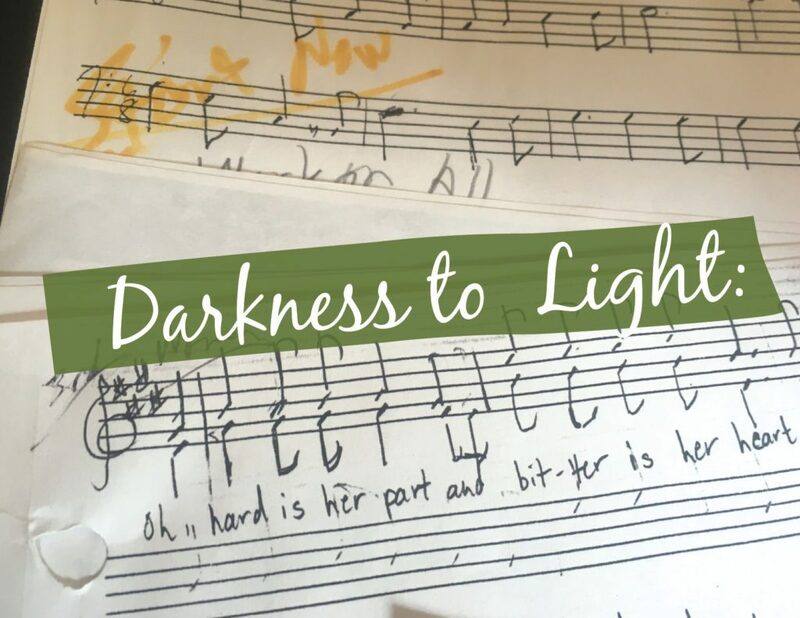 In the deep of this winter, the Burning Bright chorus, along with instrumentalists and youth and children’s choirs, celebrates two decades of offering “light in the darkness.” The concert – two performances, actually – is a handmade gift of obscure carols, folk songs, and sacred world music. Each year, the pieces reflect a theme, and in this anniversary year, it’s “Exultation.” Some pieces honor Christmas, but more centrally, Burning Bright – BB, as members say – is about the winter solstice, the night on which our hours of darkness turn toward light. “You said ‘I Am Christmas’ was your favorite song on the concert,” I whisper back, kidding, as the opening accompaniment unfolds. “I know,” Emily says with a happy sigh. “I love them all. For me, this is it. This IS Christmas.” I get what she means. Burning Bright itself started with just one song – “‘Twas on a Night Like This,” arranged for soprano, harpsichord, and oboe, to the hymn tune of “When Christ Was Born on Earth.” The first-ever performance was called “Songs of Christmas: A Concert for Harpsichord and Voice,” says Decorah business owner Ellen Rockne, the “voice” in question. 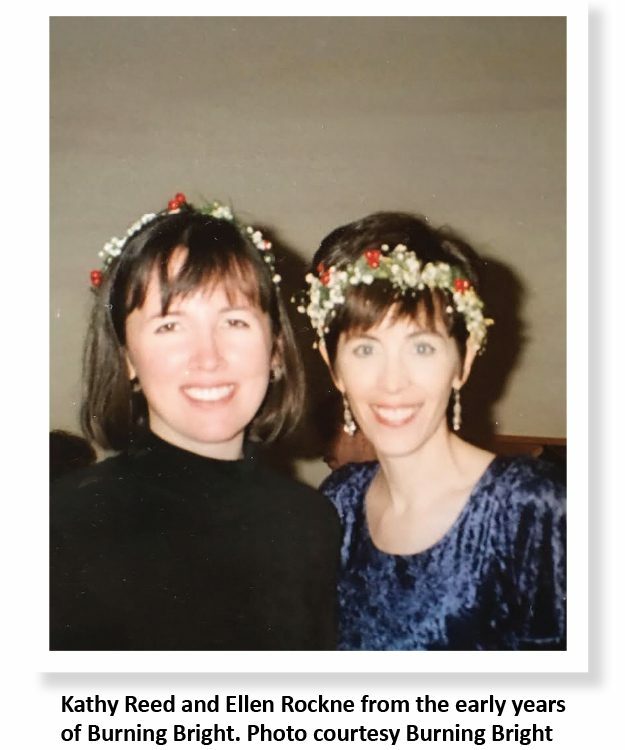 A child of the Lutheran singing tradition, Ellen was already a chronic music organizer and accomplished soloist when she moved to Decorah in 1996. 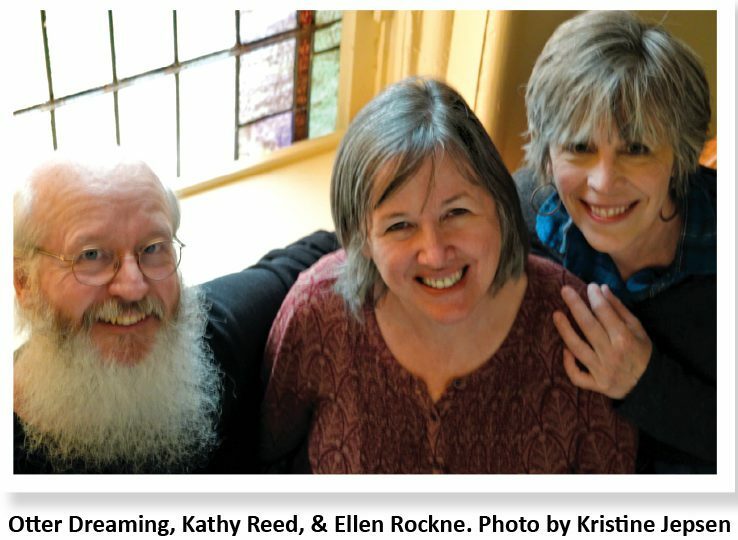 She crossed paths with Kathy Reed through their young children’s homeschool activities and soon shared her dream of a winter concert to warm the cold Midwestern nights. Kathy, who is formally trained in musicology and harpsichord performance, felt their synergy immediately. “You mean, lusty?” a choir member pipes up, gambling for a laugh. If none of these songs or techniques sound familiar, that’s by design. “This is never going to be a concert of familiar carols,” Kathy explains, though often there is one audience sing-along. She prepares pieces for the Burning Bright choir that resonate with her, sometimes arranging songs to fit the group. She did this for the Mary Chapin Carpenter lullaby, “Dreamland” – another piece to be revisited on the 2018 concert – by writing it for men’s voices, instead of a solo woman’s. This is how Burning Bright keeps musicians and audiences coming back: By stitching together a colorful mix of lesser-known music, and welcoming darker themes – fear, grief, loss – along with those of light, hope, and joy. “One of the most rewarding and touching things for me,” Otter says, “was performing a short, very personal piece I composed reflecting on the deaths of several friends and family members. I received a thoughtful card from someone who had been in the audience that year, thanking me and telling me how it had helped her to accept her own mother’s death. On a lighter note, Burning Bright members gladly anticipate being caught off-guard by the wit of founding member-singer and sometime-banjo accompanist Dale Kittleson. Known for telling dad jokes when rehearsals get tense, Dale has reportedly encouraged chuckle-inducing costumes and lyrics, such as to the 2017 performance of, “Farewell, my friends, I’m leaving FaceBook…,” a satirical anthem about digital-device dependence. On another concert – without the knowledge of, let alone permission of, the conductors – Dale orchestrated a coup in the bass section. As the song’s verses lilted along, Dale and his cohort stood up and sang their part, “…five for the oxen standing by…” – in their highest falsetto. “The entire church just erupted in laughter,” Dale says of the packed-to-capacity audience (almost always the case for Burning Bright performances). “I can’t remember who was conducting, but their jaw was on the floor. Then we basses sat down like nothing at all was out of the ordinary, and the sopranos, who followed us in the song, were cracking up, but somehow the beat went on. Now,” he says, with mock seriousness, “in what other group can you pull that off and know, even before you risk it, that your fellow performers will not excommunicate you? Close to show-time each season, the Burning Bright choir is joined by local instrumentalists – bass, violin, guitar, clarinet, hand drums, recorder, harp, and more. Retired Luther College librarian and professional mandolin player John Goodin was among the first to perform on the concert. He now arranges music for mandolin and writes manuals for Mel Bay Publications – along with scouting out a reel or jig to play on the concert with Decorah violin teacher/performer (and professional vegetable grower) Erik Sessions. Their duet has become a Burning Bright tradition, almost always ending in a blazing, fast-as-they-can-play finale that rouses thunderous applause. Proceeds from ticket sales for each Burning Bright concert go to non-profit organizations – usually shedding light on underserved populations at home or abroad. 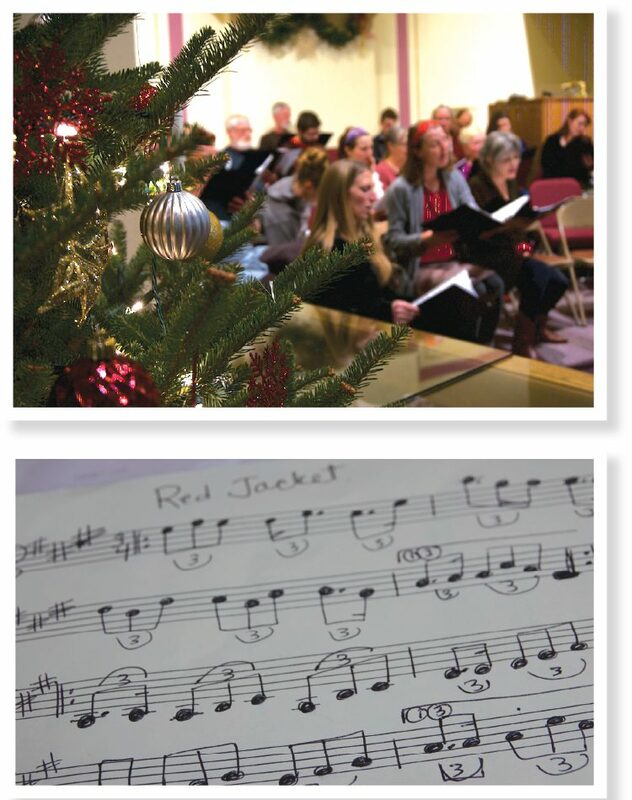 In addition to Decorah Community Food Pantry, the flagship beneficiary each season, choir members nominate and vote on charitable organizations with which they have personal involvement. 2018 beneficiaries are: Neighbors Helping Neighbors of Decorah; Northeast Iowa Peace & Justice Center; Re-Member of Pine Ridge, South Dakota; and The New Hope Jeremiah Project of Cape Town, South Africa. 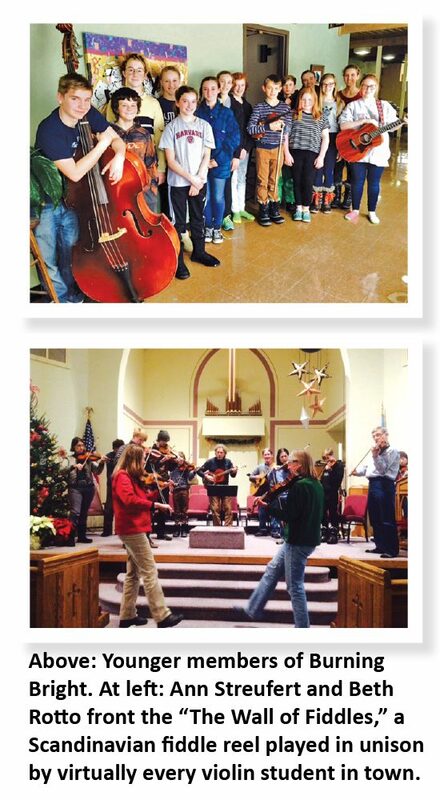 So it happens that, each midwinter, a concert in the spirit of true community comes together. Performers wear no robes or formal dress – just “jewel-toned” concert attire that might “glow” in the soft light of the chancel. Adult singers steward younger ones, making sure they can see the conductor and be seen by the audience, amidst their shuffle into place, their sly little hands waving to family in the pews. There will be moments, without doubt, when the music makes space for sadness, doubt, or hurt – making the rising aura of peace and joy feel whole and true. Like Burning Bright founder Ellen Rockne, Kristine Jepsen grew up in the Lutheran singing tradition and so loves performing on this winter concert. Outside of the alto section, she writes for literary journals and small businesses – more at kristinejepsen.com. Advance tickets recommended – available at Oneota Community Food Co-op . 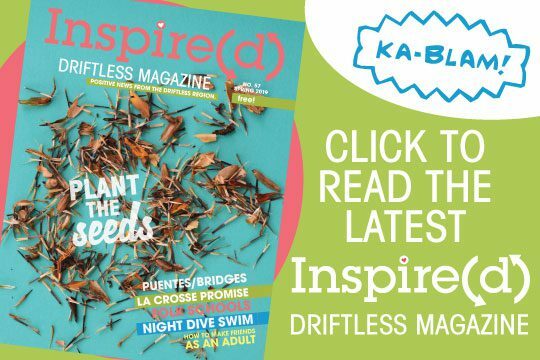 Read the Summer 2018 Inspire(d)! 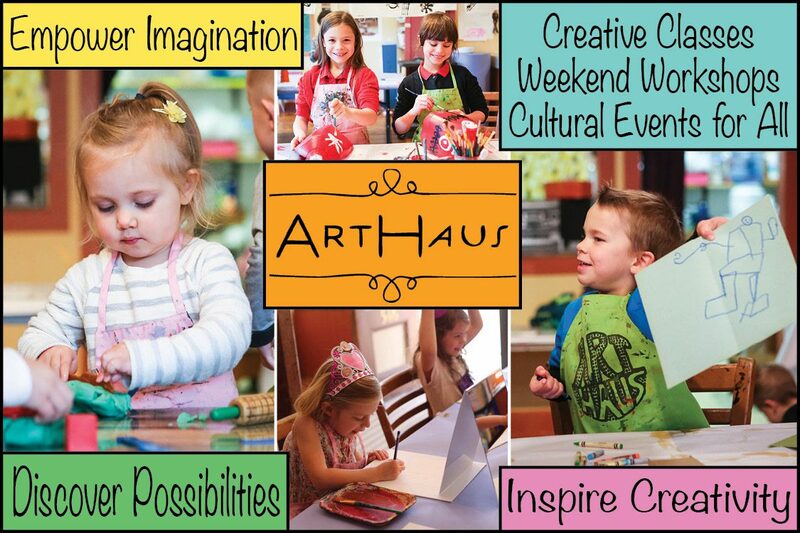 4-H • Dunning’s Spring bridge / Stonemason Ted Wilson • Viroqua’s Growing for Good • Adventures in the Driftless • Summer “Fill Your” Bucket List • Wabasha’s LARK Toys • Sum of Your Business: WW Homestead Dairy, Paper Butterflies, & More! Thinking back on my childhood, summer was all about adventures. Oftentimes, those adventures were just exploring the woods in my backyard or going down to the nearby creek with my cousins to squish cold mud between our toes. This is the stuff of summer, you guys! Need a little inspiration to get you started? You clearly came to the right place! 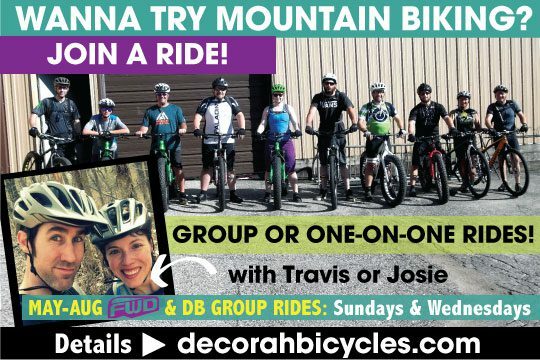 Check out our Summer Fill Your Bucket List, and some great events you might want to add to your Adventure Calendar this season (ever heard of the Catgut Paddle? It looks awesome!). 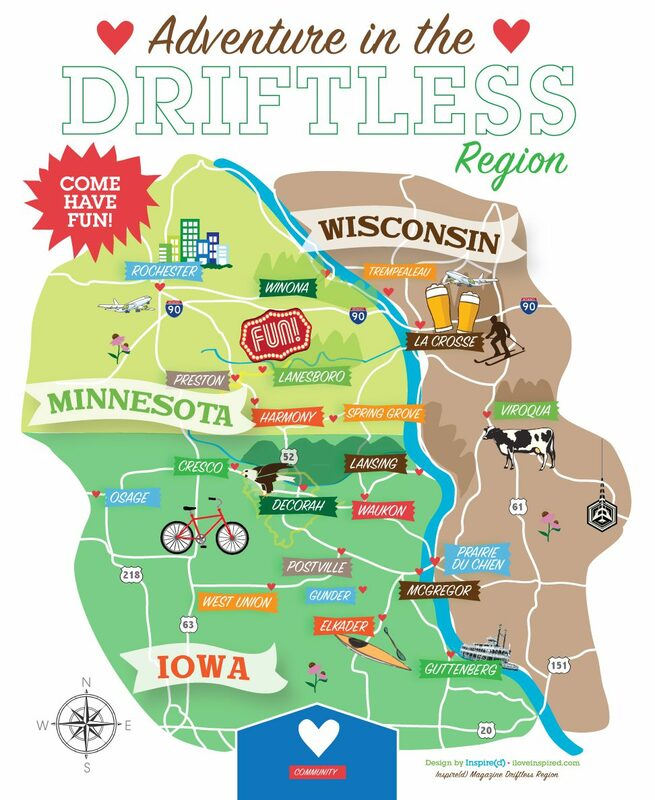 Adventuring Ideas start on page 34, plus there’s a nice round up of resources available for exploring our little corner of the Driftless (pg 64), compiled by recent Luther grad Elizabeth Bonin. 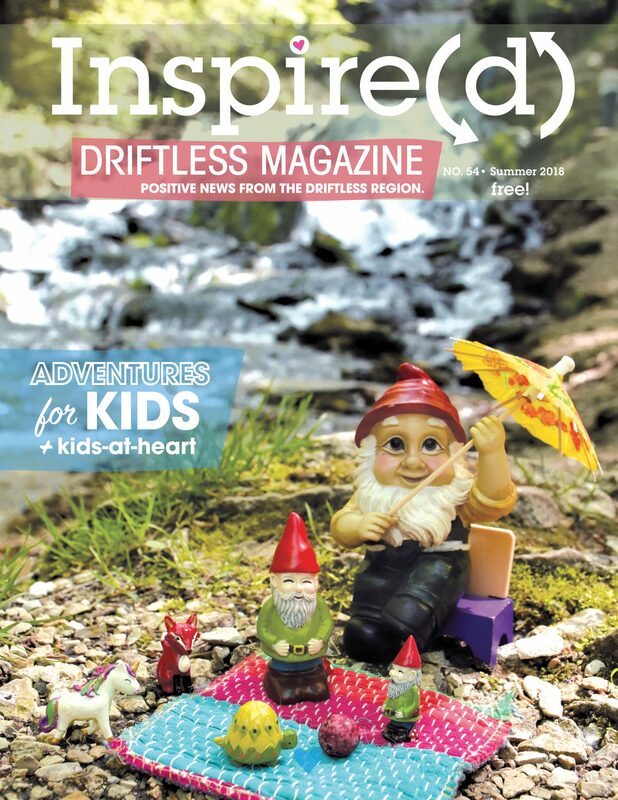 CLICK HERE to read the Summer 2018 issue of Inspire(d) Magazine! I know one adventure we’re adding to our list for sure: LARK Toys in Wabasha, Minnesota. How is it that I’ve never been to this giant (seriously, it’s 21,000 square feet!) toy store? Reading Maggie Sonnek’s story about how the current owners took on this “Willy Wonka-style” job – and how it connects to a slower pace of life – was truly beautiful (pg. 55). Another big part of my childhood summer was 4-H. At the end of the school year, I would pick a pattern with my mom, and together we’d sew a project (inevitably we’d run right up on the fair deadline in July – an early sign of my aversion to deadlines?). I would often submit a photograph or another craft too, or maybe even do a presentation (I got to go to Cattle Congress as a junior member!). I remember painting awesome trash cans with our 4-H club name (the Cherry Valley Chums) for the Allamakee County Fair and working the food booth with fellow members. So yes: Fair time was the best! 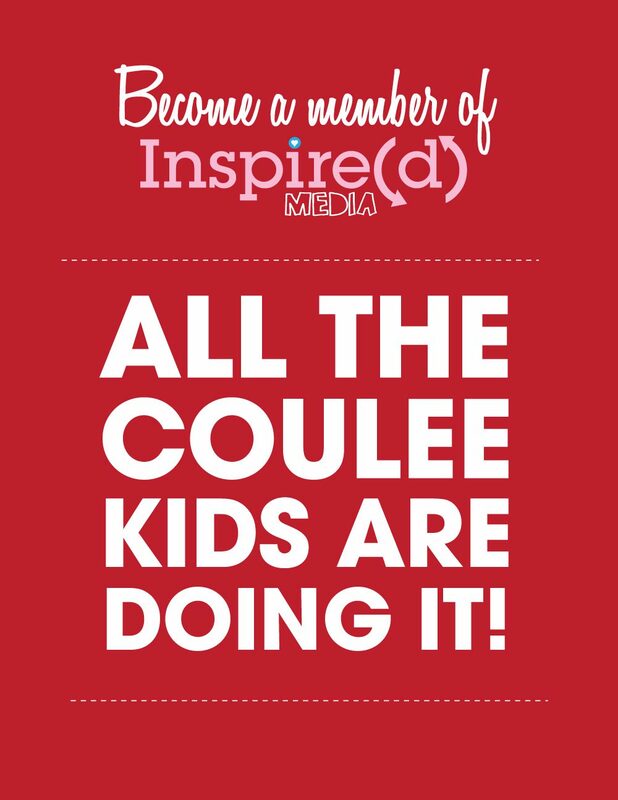 I think the Einck kids featured in this issue of Inspire(d) think the same thing (pg. 14)! Sara Friedl-Putnam tagged along with these three Decorah siblings as they took care of some of the animals they’re showing at the Winneshiek County Fair – from chickens to dogs to sheep to goats! Going through the livestock barns (and the 4-H building) is one of my favorite parts of the fair, and it was fun to get the background on what it takes to get there, and learn some of the history behind my beloved 4-H organization as well (pg. 14). We’ve got lots of other great stories woven throughout this issue too – Growing for Good in Viroqua, Wisconsin (pg. 26), WW Homestead Dairy in Waukon (pg. 51), a wonderful probituary, and more. We hope you have a great summer, friends, and that this magazine helps inspires you to get out adventuring! 21 Ways to Kick the Winter Blues! It’s tough to stay positive in the winter – when it’s edging on four feet of snow outside, the thermometer hasn’t popped above zero in days, and the only fresh vegetable in your house is a month-old potato, the force of the couch is strong. If it’s a blanket that’s made to be worn, it’s okay, right? Wrong! At least not in the long-term. As Dylan Thomas said: “Do not go gentle into that good night.” Use this winter to get happy, inspired, and ready for spring! There really is no such thing as “no time”. There is definitely “little time”, though, so you have to schedule the things you enjoy most – literally put them on your calendar on a time/day that you set, and stick with it. Go to a movie, get a beer or coffee with friends, take a yoga or meditation class (read some tips on meditation here). If it were my schedule, I might get a massage, take a bath…maybe even pencil in a nap! Exercise increases your overall health and your sense of well-being, which puts more pep in your step every day. 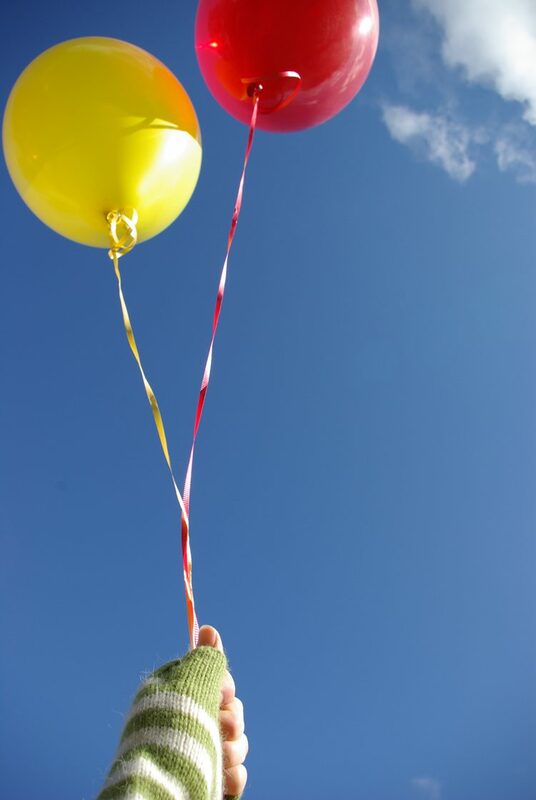 Exercise pumps up your endorphins, your brain’s feel-good neurotransmitters. It’s meditation in motion. After a workout, you’ll often find that you’ve forgotten the day’s irritations and concentrated only on your body’s movements. As you begin to regularly shed your daily tensions through movement and physical activity, you may find that this focus on a single task, and the resulting energy and optimism, can help you remain calm and clear in everything that you do. It improves your mood. Regular exercise can increase self-confidence and lower the symptoms associated with mild depression and anxiety. Exercise also can improve your sleep, which is often disrupted by stress, depression, and anxiety. All this can ease your stress levels and give you a sense of command over your body and your life. Make a schedule and stick with it. At Inspire(d) HQ, we are currently loving spinning, yoga, pilates…and dancing, of course. Always dancing. Oh – and who could forget sledding?! Just embrace it. It’s here. Sledding, snow angels, snowball fights, snow forts, skiing, snowshoeing, snowboarding, snowmen. I’m already excited! This sounds so simple, but you’d be amazed at how a little music can change your whole outlook on the day. Pick a playlist that is upbeat and makes you nod your head. Now just keep nodding. This is you saying “yes” to your day, even if you didn’t know it! If you’re going to be inside all winter, you may as well like what you’re looking at! Walk around your house with a basket, filling it with things that don’t have a home. (You might need a pretty big basket. That’s okay.) When you’re done, look around and see if you’ve missed anything. Be relentless; surround yourself with only things you love! Next go through the basket and make piles: to donate, to recycle, to trash, and to keep. Get the first three piles out of your house as soon as possible, then come back to address the last pile. 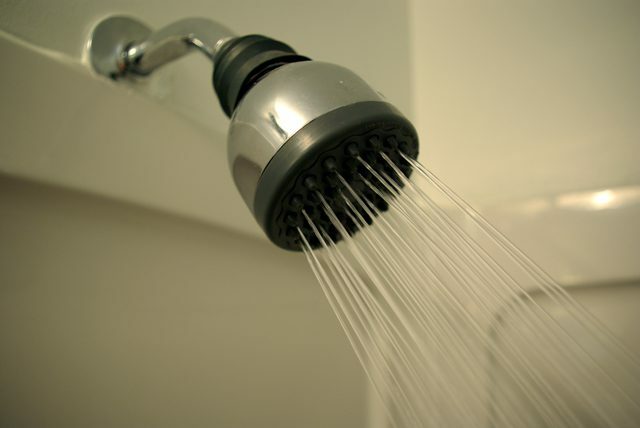 Find solutions for storing these items so they will be easy to find and put away in the future. Then look around at your tidy house and all the things (and people, of course) you love. It’s a happy thing, right? While you’re in house mode, maybe it’s the perfect time to rearrange! 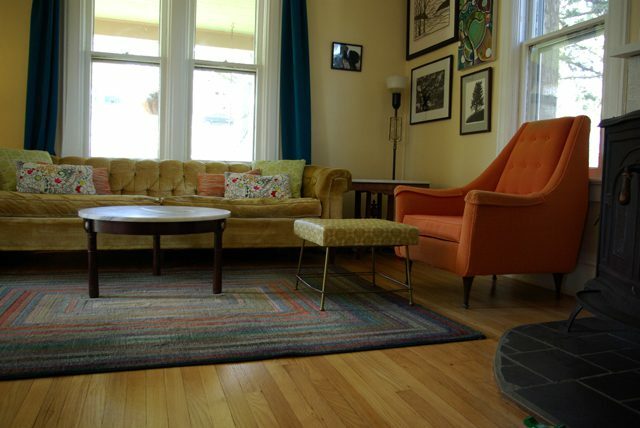 A new living room layout can feel like a new house! 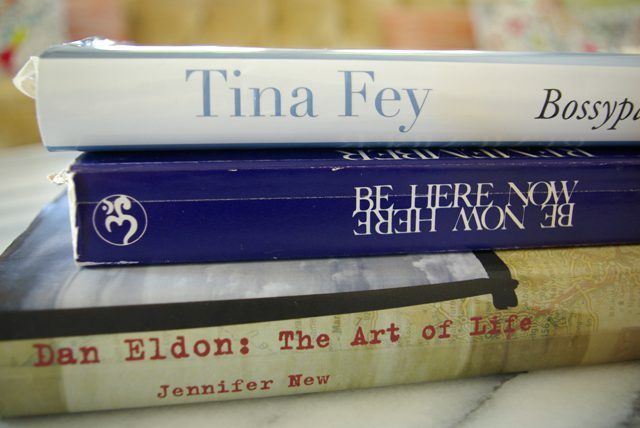 Take it a step further and learn a thing or two about feng shui. We enjoyed “Clear Your Clutter with Feng Shui” by Karen Kingston. Reminder: Check with your local bookstore to see if they have what you want to read in stock! Getting and sending mail feels good, and so does letting ink tell your thoughts to a piece of paper. Try it this winter! Write a letter to your kids to open years down the road (or write a letter to your parents to give to them when you graduate or get married or just because). This is something I started doing in college when I felt a little down or (shhhh) homesick. 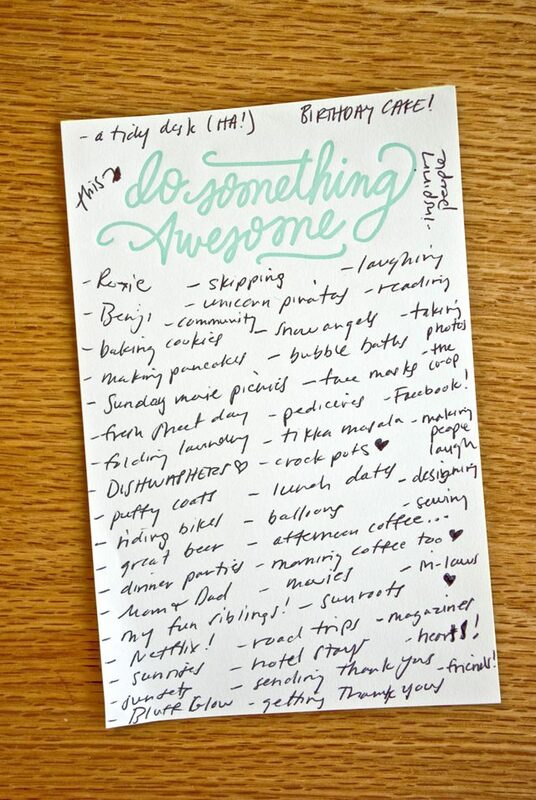 I would take a piece of paper – it can be big or little – and absolutely cram it with things that made me happy. From coffee to best friends to nice sheets to scarves to fresh snow to chocolate. Usually by the end I was feeling…gasp…happy! I also tucked the lists away. It was fun to happen upon them randomly later – (almost) as good as finding a long-forgotten $20 in a winter coat! Sometimes the best thing about winter is leaving winter. If you can’t swing a ticket to warmer climes right now, start planning for a “someday” trip. Make a savings strategy and a folder filled with sunny images. Even if it takes a decade to collect the dough, the anticipation and Trip Advisor reviews will pull you through many a chilly night. Roxie has just started shouting MOON at night, and that, we think, is a great way to celebrate this dark, dark season. Look at the moon! Look at the stars! Get out there in that crisp air and breathe it in and just look up. While you’re at it, learn some constellations – it’s fun! Our favorites in the northern hemisphere winter sky are: Orion, Gemini (Benji’s sign), Taurus (Aryn’s sign), Pegasus, and Cassiopeia. Check out the cool astronomyonline.org site to learn more! Sometimes it’s annoying to hear “Hey, it’s not so bad,” but generally it’s true. So try to remember it. And believe it. Okay, that morning cup of coffee makes you feel happy and awake, but a cozy warm drink, sipped with a friend or by yourself on the couch – that’s all about taking care of you. 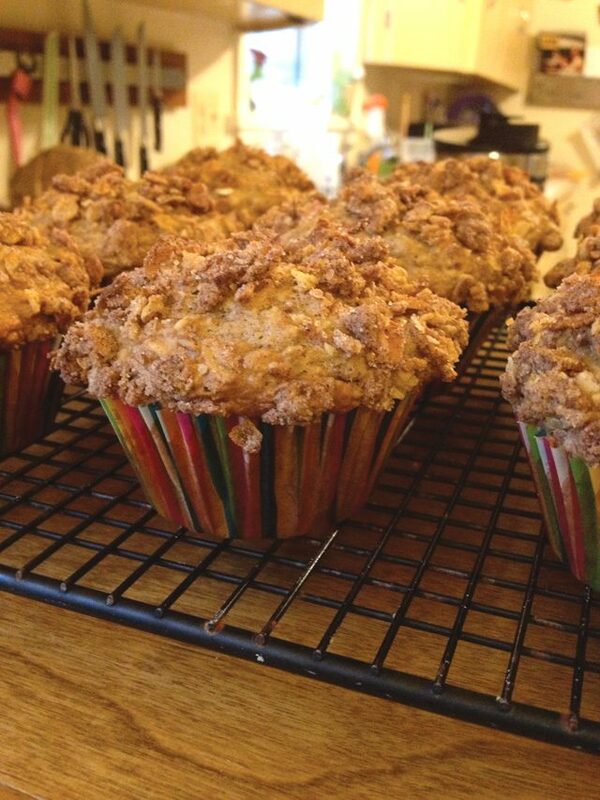 I’m pretty sure winter exists almost purely for baked goods. Few things are cozier than a warm oven sending out delightful wafts of chocolate or apple or lemon or pumpkin or caramel or (you get it)… through your house. Check out your area college’s offerings – you can often audit courses, or even simply sit in (talk to the professor first). 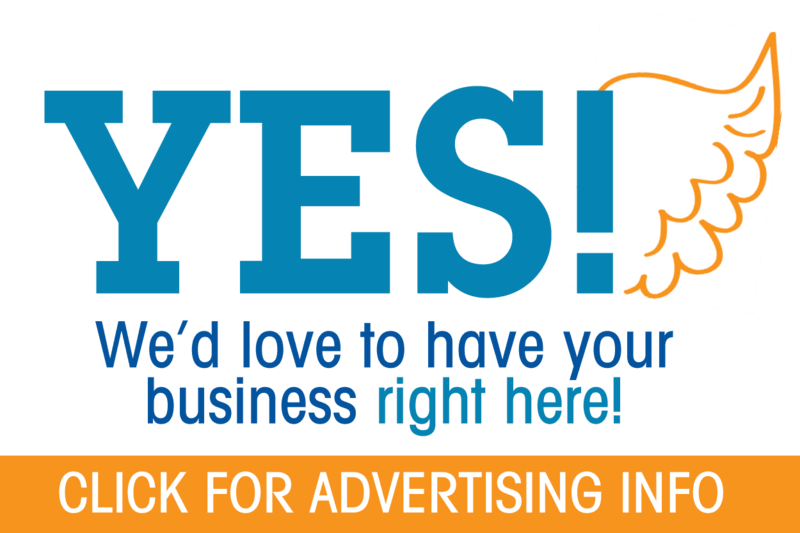 Also see what your arts organizations, galleries, and museums are up to, or even the local yarn shop or your chamber of commerce. You don’t have to wait until January 1 to tackle a goal or learn something new! 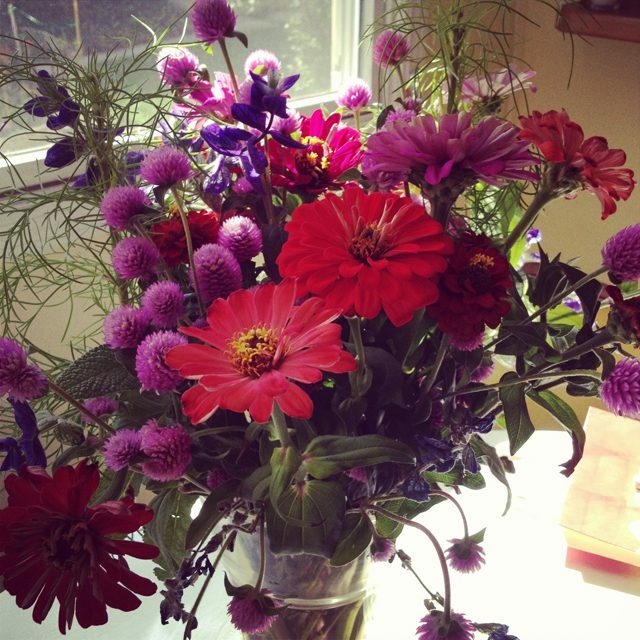 I love to have fresh flowers on my table – that shot of color brings a smile to my face every time. But you could also make paper flowers or even a paper heart garland for a wall. Easier said than done, but boy is it nice to have friends. This new friend can be useful for planning trips, throwing dinner parties, coffee dates, as an exercise buddy or pen pal, or if you need help moving a couch! Pretty sweet dividends, right? 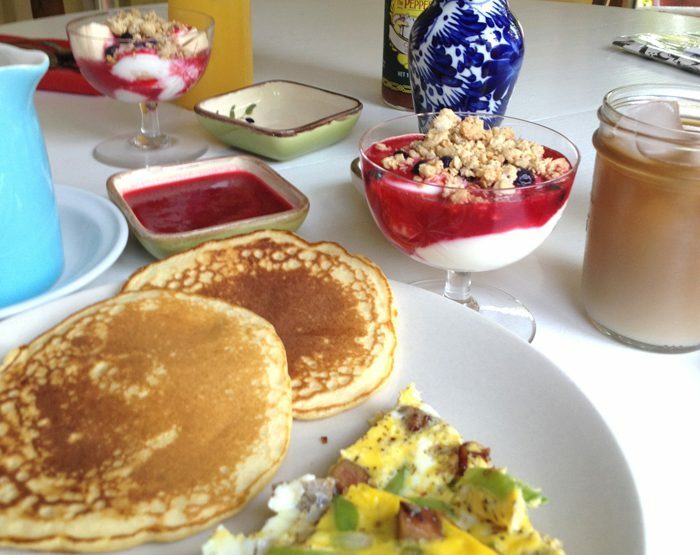 Small get-togethers make long winters zip by. 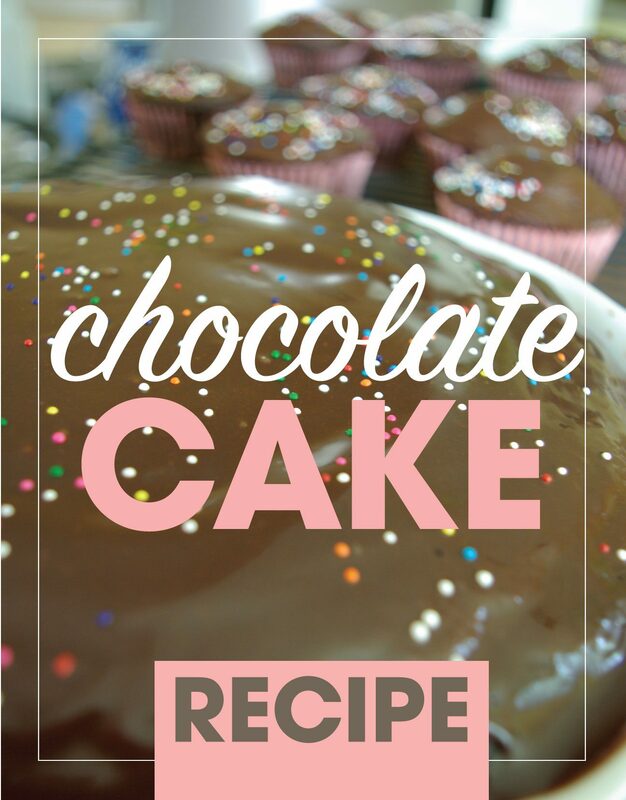 Make it a potluck and it’s even easier! Aryn Henning Nichols loves the first snowfall, but hates the 54th (you know, that one in May). Finding creative ways to get happy has been a life-long goal, and a big part of why she started Inspire(d) Magazine with Benji over seven years ago.